This beguiling hill town is one of the southern Marche's smaller gems. The old centre stands nobly on its own plug of rock neatly separated from the modern part of town. The place still has an old-fashioned air about it and little has yet been over-restored. Although it is fun to visit when the busy Thursday market is in full swing, you'll have to park some distance from the centre. First stop is the unusual triangular main piazza dominated by the beautiful town hall - one of the finest examples of 15th century civic architecture in the Marche. The building's lovely upper loggia and swallowtail battlements give the square true class. 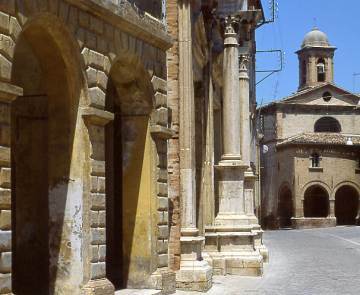 The church of Santa Maria della Rocca stands a little way from the main piazza, along via Roma. The romanesque -gothic church is one of the area's most important examples of Piceno monastic art. It is striking, above all, for its imposing austerity, made all the more powerful by its position overlooking the city and the surrounding hills. The building began as a Longobard castle before being passed to the Abbey of Farfa around 1000. 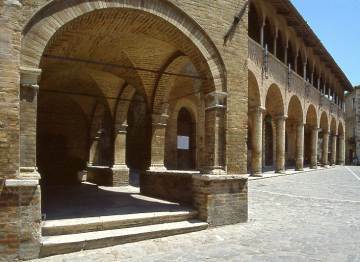 The present building dates back to 1330 and provides clear evidence of the peculiarity of Piceno monastic style, which is marked by simplicity and an almost total absence of decoration. The upper church, with its single, notably high nave and truss beam ceiling, is reached by a spiral staircase. Note the recently restored 14th century frescoes in the apse. The altar is also interesting - it is made from a stone sarcophagus from the Roman period and carved with dancers and bunches of grapes. Back in the town centre, a web of narrow alleyways beckon you to explore - look out for the numerous Renaissance details while you wander about. Then to round off a visit you could always buy some of the hand-made lace - pizzo a mano. Lace making is one of Offida's most common crafts. Women can still be seen, seated at their doorways in old town passageways, working intently, often with great rapidity, with bobbins, threads of white or grey yarn and pins on designs of flowers and animals. Originally begun among working families in the 1400's, the art of lace making was later cultivated by religious orders and aristocratic families. It was the Benedictine nuns who encouraged the spread of this art, which led to an increase in production during the second half of the 1600's. In 1979, the Offida Craft Lace Co-operative was set up to encourage the production of the high-quality Offida lace and to sell it directly to the customer. Things lacy - and culinary - are celebrated annually at the Mostra e mercato del merletto in mid-July. Offida is also an important wine-making centre and the white pecorino is a particularly characterful wine made from a local grape.